Turf Moor staged its final top tier fixture of the term as the Clarets earned their ninth clean sheet of the season in a 0-0 draw with Stoke City. Burnley’s season was effectively summed up in 45 first half minutes. The hosts were creative but lacked the clinical edge to force a route beyond Potters stopper Jack Butland. Danny Ings’s winner against Hull City at the KC Stadium was the club’s first in 10-and-a-half hours of football, and they failed to add to that in the opening half against Stoke City at Turf Moor. With relegation back to the Championship already confirmed, and the pressure off, Sean Dyche’s side controlled and dictated the fixture but they found England international Butland too good. Ings failed to make the 22-year-old work early on when cutting in from the left hand side and scooping his effort in to the goalkeeper’s arms when attempting to wrap his boot around the ball. Butland again demonstrated why he’ll soon be adding to his solitary cap in Roy Hodgson’s international set-up, denying George Boyd’s header from Ben Mee’s cross before thwarting Ings’s driven rebound. After Scott Arfield’s shot was blocked in the same sequence, Butland moved intuitively off his line to divert Kieran Trippier’s cross away from Ings with his fingertips to alleviate the pressure once more. 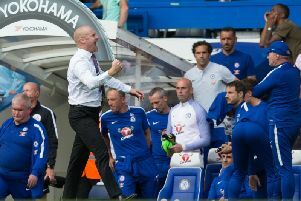 The chances continued to come for the Clarets, but such profligacy is the reason behind their bottom three finish in the Premier League. Boyd’s tremendously executed turn forged a path past Steven N’Zonzi inside the box and his delivery eventually fell kindly for David Jones, but the midfielder was denied a first goal of the term courtesy of a superb reflex save from Butland. Butland’s next involvement proved routine, but it was another good opportunity for the hosts to break the deadlock. Ashley Barnes broke, drew his marker, and offloaded the ball to Ings but the striker’s right-footed effort from outside the box was saved low to the keeper’s right. In a desperate attempt to register a shot on goal, Charlie Adam tried audaciously from distance but his effort didn’t come close to replicating his ‘goal of the season’ contender against Chelsea at Stamford Bridge. Mark Hughes’s men slowly grew in to the game, though Tom Heaton was perfectly positioned to claim a Jonathan Walters header after the Irishman connected with Erik Pieters’s set-piece. Walters turned provider soon after when used as the outlet from Adams’ counter, but Mame Diouf somehow managed to head wide of the upright from close range after the cross had glided over the head of Michael Duff. And as the half came to a close, with the scoreline one of four 0-0 results at the interval in the 3 p.m. kick-offs in the top flight, Walters moved infield, was invited to travel with the ball, but shaped his attempt out of the reach of Heaton and wide of the post. The game opened up after the break, but it was the visitors who crafted the better openings. Referee Michael Oliver refused to penalise Potters skipper Ryan Shawcross for impeding Barnes who had threatened to run clear on goal from Marc Muniesa’s weak pass. Diouf had an excellent opportunity to net his 13th of the campaign, but he poked the ball straight at Heaton from close range after Jason Shackell had failed to cut out Marko Arnautovic’s cross. Ings watched his deflected effort flash wide of the upright at one end, while at the other Diouf headed in to the ground and just wide of the target. After Michael Kightly had replaced Taylor and Sam Vokes had been introduced at the expense of Barnes, Norwegian midfielder Fredrik Ulvestad was greeted with rapturous applause when replacing Jones to make his debut. N’Zonzi pulled a speculative attempt wide as the visitors searched for the winner before Heaton, seemingly unsighted, plucked Muniesa’s volley off the line after a Stoke corner had been cleared. Vokes was flattened by Geoff Cameron in the penalty area late on, but nothing was given and the clash ended in a stalemate. Meanwhile, hoards of fans remained in their seats at full-time to show their appreciation to the management team, squad and club staff, who reciprocated with applause for the club’s loyal fanbase.